Convention spokesman Herb Hollinger said the last straw was the episode of the ABC sitcom "Ellen'' in which Ellen Degeneres' character revealed she is a lesbian. In addition to Walt Disney World and Disneyland and the company's TV, movie and music divisions, Disney also owns a chain of Disney merchandise stores and the Mighty Ducks hockey team and has a stake in the Anaheim Angels baseball team. It has holdings in everything from cable networks to newspapers and even Broadway shows. Some Baptists acknowledged that the entertainment conglomerate is so pervasive, it will be difficult to banish Disney from their lives. At a Disney store in Little Rock, Ark., music minister Richard Wentz said there's no way he could follow the boycott. He just looked down at his 4-year-old daughter, Taylor, dressed in a pink Hunchback of Notre Dame outfit and clutching her new Winnie the Pooh books. In trading Wednesday on a declining New York Stock Market, Disney fell $1.50, or almost 2 percent, to close at $82.50 a share. 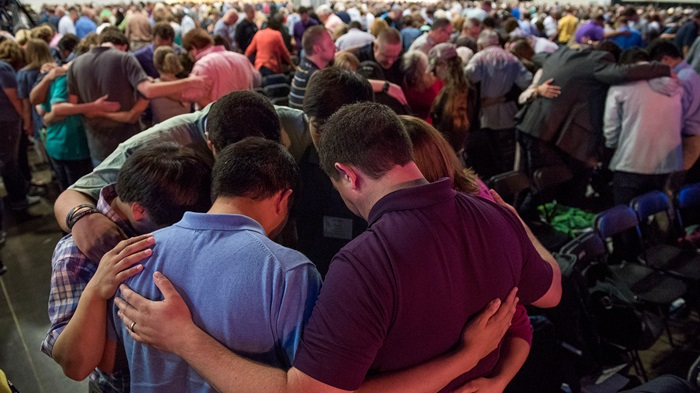 The Southern Baptists last June gave Disney a year to change its ways. Since then, church leaders said, Disney has ignored their complaints. David M. Smith, a strategist for the Human Rights Campaign, a Washington-based gay rights organization, said the resolution puts Southern Baptists at odds with most religious Americans. "Unlike the Southern Baptist Convention, most people of faith recognize that they can disagree over whether or not homosexuality is right and still agree that discrimination against gay people is wrong,'' Smith said.